Lore Lindu is the name of a national park in the Province of Central Sulawesi, the Republic of Indonesia. It has become an important destination for visitors who are interested in birdwatching. I organize tours in this area for tourists who want to spend a few days of their trips watching birds around Wuasa, Sedoa, Lake Tambing, and Anaso trail. To reach the park, we need to fly from Makassar city to Palu city. After that we can continue our trip by car to the national park. On the way to Lore Lindu, we could stop at a bridge whose area is covered by grass. It is the natural habitat of Savanna Nightjar (Caprimulgus affinis). The bird sleeps during the day and then go out at night to find food and mating partner. 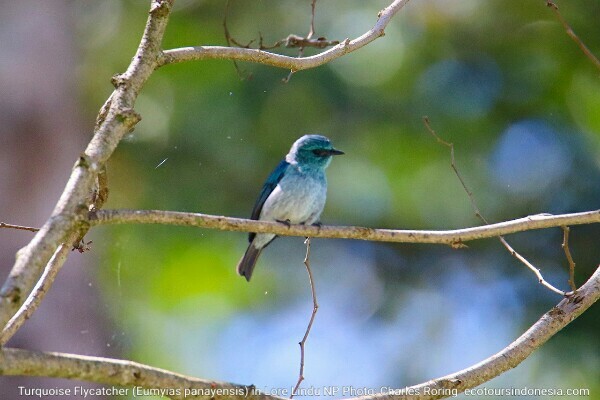 Other birds that can be seen are Ashy Woodpecker, Blue-tailed Bee Eater (Merops philippinus), and Collared Kingfisher (Todiramphus chloris). After watching these birds, we could continue our trip to Wuasa village. The ride takes three and a half hours from Palu to Wuasa. Cars that bring us have to go up and down steep zig-zag slopes, sometimes with cliffs on the sides of the road. It will be dark when we arrive at the lodge. Our rooms are booked several weeks earlier, the owner has enough time to prepare our beds. The lodge is not a luxurious hotel but every room has got its own bathroom with toilet. Tourists who stay there could enjoy breakfast. Lunch and dinner are provided upon special arrangement with the owner. We have our dinner usually at 07.30 at night and go to bed early. The next morning, we will wake up at 04.30. After making some preparations, we will leave the lodge at 05.00 for Lake Tambing. It is quite far from the village where we stay. Our cars stop at the parking area. There are a lot of birds that will be shouting, or singing in the morning. We can watch Yellow-sided Flowerpecker, Grey-sided Flowerpecker, Ornate Lorikeet, Cerulean Cuckooshrike, Piping Crow, Fiery-browed Starling, and Lesser Myza - also called Black-eared Myza. To watch the birds, I use a pair of Visionking 10×42 binoculars and a 20-60×60 spotting scope mounted on a tripod. I also bring a D-SLR camera, Canon 200D with Tamron 150-600 mm G2 lens. Most bird photographers whom I guide have got better cameras with larger sensors. But there are also birdwatchers who bring bridge cameras such as Nikon Coolpix P1000, Canon SX60HS. During the day, we still can explore the surrounding forest of Lake Tambing to see birds along the road area. Sulawesi Thrush, Sulawesi Drongo, Slender-billed Cuckoo Dove, Sulawesi Hornbill, and Knobbed Hornbill are some of the many birds that we can see or take pictures of. We can spend most of our time walking on the road side. In the evening, our cars will slowly go down the Sedoa slope back to Wuasa valley. But we do not go directly to our lodge. We will stop for a while at a cocoa plantation area or farmland to do the calling for Sulawesi Scops Owl. In general, we will wait for around fifteen minutes for the birds to come. He usually flies in the air and land on the branch of a tree in front of us. If he shows up, we may take pictures of him. When we have finished, we can return to our lodge immediately. The next morning we will leave our lodge by cars again when it is still dark. We will arrive at the foot of Anaso Trail at approximately 05.00. 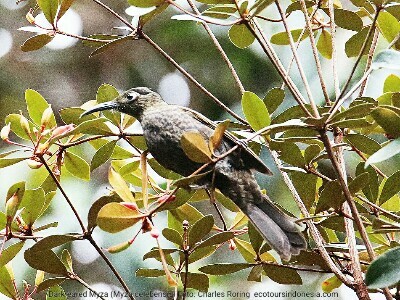 We would go hiking along the slope of Mount Anaso to find more birds of Sulawesi. It will be a very long walk but a very nice one. We have the possibility pf watching Cinnabar Boobok, Hylocitrea, Geomalia, Snowy-browed Flycatcher, Citrine Canary Flycatcher, Purple-bearded Bee-eater, Golden Mantled Racket-Tail Parrot, White-bellied Imperial Pigeon, Grey-headed Imperial Pigeon, Red-eared Fruit Dove. The next few days exploring Lore Lindu National Park and the farmlands of local people, we can still see a lot of other birds as well including Blue-fronted Flycatcher, Rusty-bellied Fantail, Cinnabar Boobok, Yellow-billed Malkoha and etc. 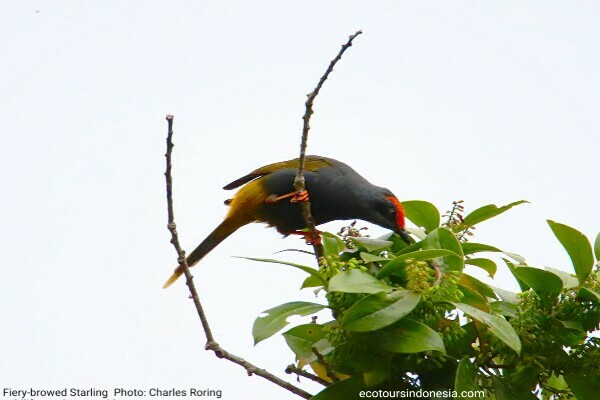 The province of Central Sulawesi is a great place for birding, and sightseeing. 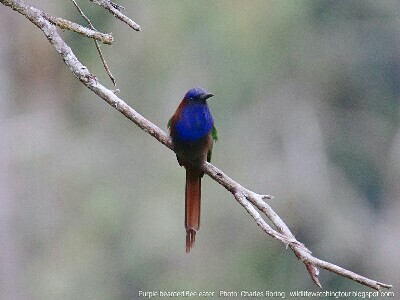 If you are interested in birding in Lore Lindu National Park and want me to arrange your trip in this region, please, contact me by e-mail to: peace4wp@gmail.com or by whatsapp to: +6281332245180.